Redmond is growing, and faster than many of us imagine. 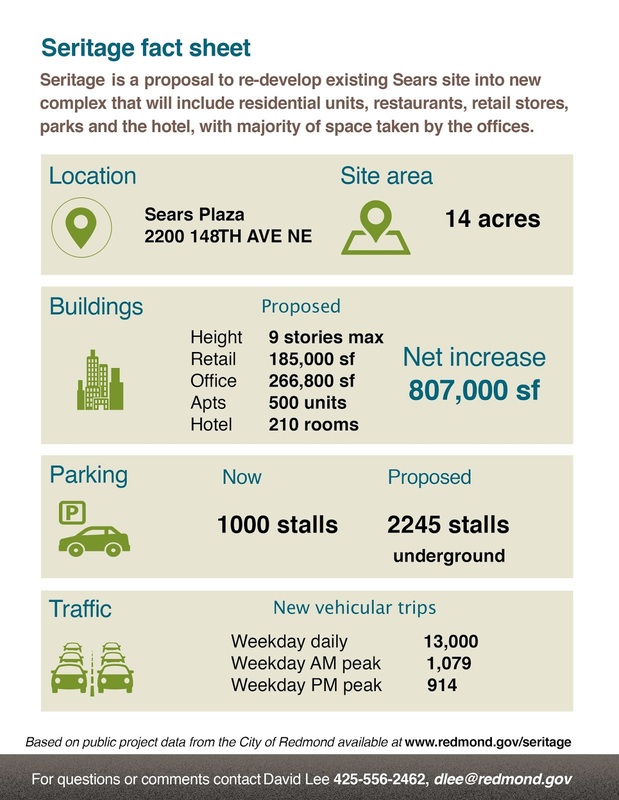 One major new project is "Seritage" - a proposed redevelopment of Sears Plaza on 148th Ave into office space, hotel and residential units. If you live in Overlake, shop in the area or commute through it, or just want to give input, please consider attending the meeting on Thursday, March 8, 2018 6:00 p.m. – 7:30 p.m.
Redmond Community Center At Marymoor Village Room 202 6505 176TH Ave NE Redmond, WA 98073 (425) 556-2300 to learn more and provide feedback on the project. · The project is huge! The site area is 14 acres, and the proposal will increase the buildings area by 800,000 sq.ft. If any of the design assumptions on the project are not correct, it is likely that the traffic gridlock in the area will intensify. The best way to influence the project is to get informed and provide comments to the city either at the meeting or via email. 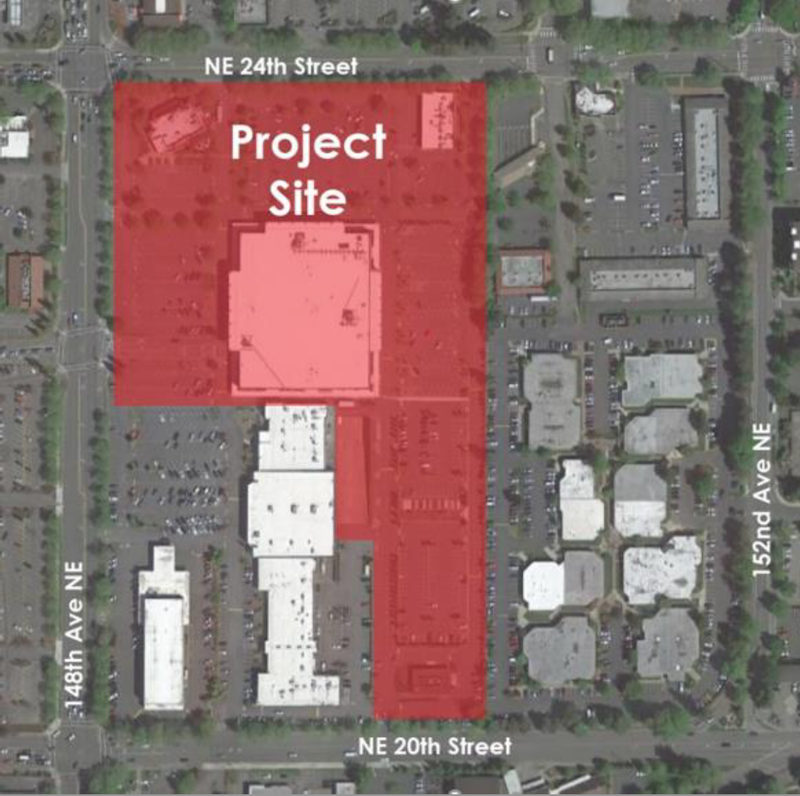 After all, there are 10,000 of us in Overlake today (in Bellevue and Redmond both) and many have a perspective on proposed development and its impacts. As an aside - the city has already had two meetings for this project in 2017 (total of eleven residents showed up), and it took quite some effort by the Council to get this third meeting set up. If the community does not take part in a discussion, we may wake up one day to a row of high rises and traffic jams to rival Seattle. Redmond is growing, and faster that many of us imagine. 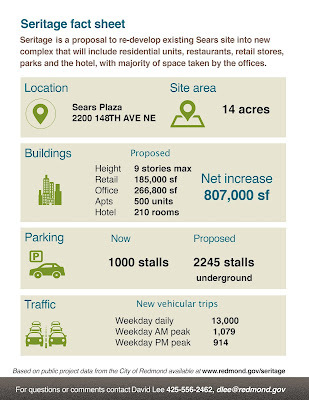 One major new project is "Seritage" - a proposed redevelopment of Sears Plaza on 148th Ave into office space, hotel and residential units. If you live in Overlake, shop in the area or commute through it, please consider attending the meeting on March 8th to learn more and provide feedback on the project. 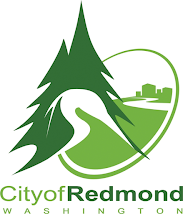 I was at a community center meeting at VALA last year when Jane Wither, a member of the One Redmond Foundation stated over time the largest population in Redmond will shift from the Downtown to Overlake. She indicated it's possible developers might be incented to raise the height of their buildings if they agreed to house a performance center, art gallery, etc. 12 stories anyone?! Disappointed. I'll vote against every sitting councilmember and the Mayor until things change. I've had enough and want to take back my city. 148th Ave NE through the Overlake area, already well known for its heavy traffic congestion during commuting hours, will become the Eastside's version of Mercer Street in Seattle. If you have a chance to attend these meetings or to provide any input, please emphasize the need to add (or at least preserve existing) traffic lanes in these areas. The LAST thing we need to do is what Seattle is doing (road diets) - removing general-purpose lanes to add transit-only or bicycle lanes. The light rail station is driving this bus as this is near the ST2 terminus, hopefully that will reduce the amount of traffic with cars. It is absolutely inappropriate to put a building 8 or 9 stories tall in this location. I can only support a smaller, more intimate development. And, traffic congestion caused by inadequate infrastructure should be addressed and paid for primarily by the developer, not the citizens of Bellevue/Redmond. Congestion affects our quality of life. Our City Council should be protecting us from this way-too-big development. What are they thinking? Redmond approves every plan no matter the height or impact. I saw only a handful of people went to the public hearings. Why should people bother to show up when the city just does not care what voters think? There is nothing we can do. 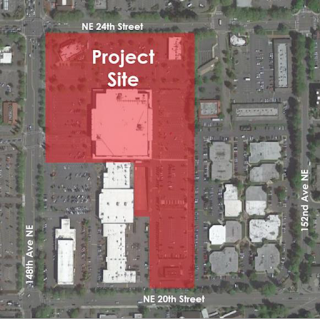 The East Bellevue development train has left the station.